It was a present from her grandma who had just come home from a holiday. 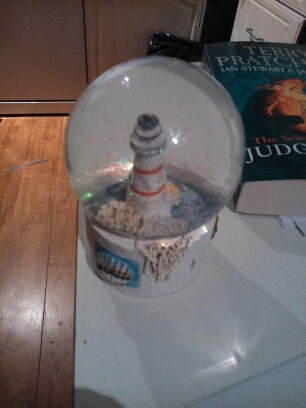 For those who haven’t seen one, it’s what is commonly known as a “Snow Globe”. There us a glass (possibly plastic) sphere set on a base which has a scene. In this case it’s a lighthouse. The sphere is filled with water (a clear liquid at least) and there are little specs of stuff in the water. Often these are white (hence the name “Snow Globe”) but these ones are strange and mesmerising, flickering with colours. Sort of semi transparent but change colour in the light. I hadn’t seen one for years, and I started spinning it and watching the glitter spin round. I guess I must have had the recent M3 exams on my mind because as I was watching them spin I started wondering what the centripetal acceleration was. As I was thinking about this it occurred to me that this system I was holding wouldn’t obey classical, Newtonian, laws, but would be governed by the laws of fluid mechanics. I did study fluid dynamics at university, I recall the navier-stokes equations. I recall looking at currents and river flow. I don’t, however, recall discovering how fluids would act when they were in a closed spherical system. Watching the Snow Globe spin is fascinating. As you spun it, some glitter collects at the bottom, if you alter the direction of spin the rise up into the middle. If you stop spinning it, the contents carries on spinning, if you reverse the spin it still carries on, and you can see the outside slow and change direction first. Due to the friction with the sphere. This then moves the rest of the liquid, but you can get an amazing sight of the outside liquid going one way, but the inside going the other. When you spin it, or shake it, then leave it to rest the glitter jumps and jives in a brilliant way. It seems like it is a sort if “Brownian Motion“, but I would need to investigate it further. All in all, I’m fascinated by this Snow Globe, and I am going to read up on fluid dynamics, their effects in a closed spherical system and brownian motion as soon as I get chance. If you have any suggestions of books, papers, articles, blogs etc on the subject, I’d love to hear them! Today I was reading an old carnival-of-mathematics. Carnival 71 to be precise. In the intro, the host Robin Whitty (@theoremoftheday) stated that “71 is the smallest prime that can be expressed as x^2 + xy + 2y^2 where x and y are nonnegative integers. (a mini-puzzle: find x and y giving 71)”. I find it hard not to attempt puzzles, so I had a little think about it. The puzzle itself would be extremely easy to solve using Trial and Improvement methods, especially with a bit of help from a computer, but that’s no fun so I thought about it logically and decided to attempt it mentally. The first thing I noticed was that only one of x and y could be odd and only one even. We were dealing with the sum of 3 terms. The third has a factor of two, so is definitely even. This means that one of x^2 or xy must be even, and the other odd, as if they were both odd or even then the sum would be even, yet 71 is odd. If x and y are both odd then xy and x^2 are both odd, and likewise for even numbers. Going a step further, if x is even, then x^2 and xy are both even, so x must be odd and y must be even. The next thing I noticed was that x has to be less than 8. As 8^2 is 64, and if you add another 8 you are too high. Likewise, y has to be less than 6, as 2(6^2) is 72. This left me with x is an odd number less than 8 (so 1,3,5 or 7), and y is an even number less than 6 (2 or 4). Thinking logically, we can rule out x = 5, as the only odd number x^2 + xy that that can end in is 5, and for that to work for the equation 2(y^2) would need to end in six, which would need y^2 to be odd, which it isn’t. A nice little mental workout, which I rather enjoyed! This week my A Level students sat their Core 1 and Core 2 exams. Both papers were, in my opinion, fairly nice. Although there were questions on each paper that were asked a tad differently that threw a few students. The general consensus amount my students, and other teachers I’ve spoken to, differed majorly between the year 12 students and the year 13s who were re taking for whatever reason. Year 13, on the whole, found the papers much easier than year 12. This got me thinking about the make up of the A Level course and the placement of exams. I’ve long thought that sitting all the exams at the end if year 13 would be beneficial. When I arrived at university I met friend Steve for the first time. In one if those early conversations we discussed the make up of our A-level courses and he explained how he had done a modular course, but sat them all at the end. I suggested that seemed silly and he disagreed, saying “but P1 is well easy once you’ve done P6” (those were the days before “pure” modules became core modules). The other exam this week was M3, this was nice enough, for an M3 paper. It was hard, but M3 IS hard. I don’t understand why it was scheduled so early on in the session. All in all quite a nice set of papers, I’m quite looking forward to the next ones! I’ve had a number of conversations today that have got me thinking about educational research, Ofsted guidance, and how they are, or worryingly often aren’t, linked to what’s actually going on in schools. During one conversation with a PGCE student I was informed about certain practices which were heavily integrated into the CPD offer at her previous placement school which have now been totally debunked. This led the conversation down a windy path. We discussed lots of things but the crux of it was centered around how this could have happened. The reasoning isn’t necessarily fully correct, but we hypothesised that this could happen when people leave their own learning behind once they qualify. The possibility is that people can be trained in whatever is deemed good practice at the time, but without continued learning and engagement with research and policy they don’t necessarily know when the world moves on. In another conversation a colleague of mine seemed shocked that I was writing an essay, and when I told him that a few of the books were great and would be worth his investment he suggested that that takes one hell of a commitment to education. I took this as a compliment, and thinking about it later it struck me that it does take one hell of a commitment to education, and only a handful of staff at the school would have such a commitment. Is it any wonder, then, that despite Ofsted changing tack in line with the most up to date research some schools are still working from an old playbook? Many schools are still grading lessons, I even know of some where grading and judgement are attached to a constant programme of learning walks. This is despite of the fact that all evidence points towards a developmental process of lesson observations being far more productive and beneficial to the teachers. I feel lucky to be in a school that has stopped grading observations, and where learning walks are fed back to the entire school as a “we saw this good practice” style report. It would seem that this is not commonplace elsewhere. In some schools, it would seem that management have little interest in the research and as such are working from massively outdated ideas. We need to work on ensuring the profession is moving forward, that we are developing new staff as best we can, that we are learning from our mistakes and learning from the research. This means engaging with it, and questioning it where appropriate, as David Weston (@informed_edu) and Tom Bennett (@tombennett71) suggested in York. When we have engaged and questioned, then we can apply it to our own context and each improve our own practice. At ResearchEd York John Tomsett (@johntomsett) mentioned that at his school he has appointed Alex Quigley (@huntingenglish) “Director of Research”, this sounds like a fantastic role, and shows how seriously this is taken at Huntingdon. Perhaps more schools would benefit from such a role. Tom Sherrington (@headguruteacher) tells us in this post that he sees the development of a research based CPD programme as a major priority as he starts a new headship, which shows how committed he is to this vision. Shaun Allinson (@shaun_allinson) runs a “blog of the week” for his school, to engage staff with the Blogosphere, this is a way into the research and could be beneficial for all. These are a few excellent examples, but I fear they are in the minority. I think, though, that above all, the burning issue is time. 3 hours isn’t enough time to “Plan, Prepare and Assess” for up to 27 lessons. The majority of teachers work 55-60 hour weeks as it is and would baulk at any additional “work”. It’s not impossible to engage with it on a full timetable, I do it and I know others who do and benefit from it, but to get buy in from everyone on top of such vast workloads is unlikely. What’s so good about Maths? The other day Colin Beveridge (@icecolbeveridge) wrote this nice piece about why he loves maths. Today one of my year twelve students asked why I had chosen to study it at degree level. This facts combined have made me decide to share my thoughts here. I’ve written before about how Maths is a beautiful subject, so I racked my brains and tried to pinpoint when I really decided I loved it. I remember at nursery school learning to add and subtract. I loved doing it and I have vague recollections of doing sums at home as a little one, sums aren’t really maths, in the proper sense, but I guess this was an early indication of what I would like. I always loved problem solving too, really enjoying logic puzzles and computer games with logic, problem solving and maths puzzles built in (such as “Fun School“, and “Granny’s Garden“. The latter has received a 21st century make over! Two of the things I do recall primary maths are from year 5. I have vivid memories of Mrs Hanel teaching me how to find the area of a triangle and how to construct Perpendicular Bisectors. These were things I thought were cool, but I think the real wow moment came in year 6. During year 6 I finished the maths syllabus that the school was running, and my teacher, Mr Jones, found me a text book in the store cupboard that was left over from when the school had been a middle school. I started working on Algebra. At first I thought it was pretty fun, solving equations to find an unknown, but the moment I think I fell in love with the subject was when I realised the link between equations and graphs. When I moved to secondary school I spent the first year fairly bored in maths. The classes were mixed ability and the lessons were strange. There was a number of boxes which covered each topic. Every few weeks the classes would swap and get another box. The idea was you would work through the booklets, marking your own and ten do the review tests for the book which the teacher would mark. I just did the reviews. I still loved the subject, but the lessons did bore me at times, this is evident in my national record of achievement which says “maths is my favourite subject, but sometimes it’s too easy and this can be boring.” This has certainly shaped the way I deal with Gifted and Talented pupils, making sure they are always adequately stretched. My love affair with maths continued, and still does to this day. Some topics I love (Trigonometry, Coordinate Geometry, Algebra, Calculus, Number Theory, Graph Theory and many more) some less so (Bounds, Numerical Methods, Trial and Improvement, Transforming Shapes by Hand), but as a whole I love it. I love the beauty of it, I love the satisfaction of solving a problem, I love the process of wrestling with a formula, I love that there is not just one “right” way to go about a problem, I love the stories around the maths and the mathematicians, and I love the connectiveness that’s evident with maths. Is it helping them learn? Yesterday, I happen to bump into one of my old Chemistry teachers. In conversation I mentioned that I remembered him blowing up hydrogen balloons in the classroom and saying he wasn’t allowed to so don’t tell anyone! This got me thinking about memory and the things that stick with you. Was this lasting memory useful, or was it just an explosion in a science room? I thought about it, and in this case it was useful, I remember the explosion and the claim not to be allowed to do it, but I also remember the lesson attached. That was that hydrogen was lighter than air and quite unstable, always looking for a couple of oxygen molecules to combine with. That’s why they use it as rocket fuel, that’s why the WW2 barrage balloons blew up and why we use helium, not hydrogen, in balloons for children’s parties. Similarly, in this post from last year I discussed another chemistry lesson (different teachers, it turns our my chemistry lessons were pretty memorable!) where the teacher used simile to explain ionic and covalent bonding, again I remember the humour in the lesson, but I also remembered the lesson and still to this day know the explicit difference between ionic and covalent bonds. I remember in geography being set a homework project to build a volcano. I enjoyed playing win paper masche, I enjoyed painting it. I even remember my mum coming up with the great idea of using nail varnish to put lava trails down the side. But I don’t remember learning anything about volcanoes or volcanic activity. I learned that in science later on. Today I read this phenomenal post by Tom Sherrington (@headguruteacher) about books he has read over the course of his life. He mentioned in his post he hoped others would follow. I then read this incredibly moving piece by Chris Waugh (@edutronic_net) who spoke about the literature that had a massive influence on him over his life. This made me think about reading, and the things I’ve read. I love reading, both fiction and non-fiction, but I don’t find as much time as I would like to engage in it. When I was very small I apparently used to insist that “the three billy goats gruff” was read to me every night, I reckon I still know it by heart! At primary school I read Asterix books, and very little else. The teachers I had at primary school didn’t appreciate the genius of Goscincy and Underzo so made me read other things. Most of which I’ve forgotten, but I do recall a series of factual books I loved. It included the story of Edward Jenner and James Phipps, and the story of tightrope walker Paul Bondin. These two stories stuck with me more than any other from my primary school days. Thinking on it now, I don’t think my reading repertoire actually was that limited, and that was thanks to my mum. She took us on regular trips to the local library to take books out, and bought us a veritable library of our own. I remember loving the Railway Cat series by Phylis Arkle, the Professor Brainstorm books by Norman Hunter and the complete works of Betsy Byars (The only one of hers I didn’t like was “The Animal, The Vegetable and John D Jones” which bored me), Ruth Thomas and Nina Bawden (Carrie’s war is amazing). Blimey, that’s actually quite a lot! There were many more too, so clearly my earlier claim was clear nonsense. When I reached high school I had lost the buzz for children’s stories, and for a time read nothing but autobiographies. Musicians, Sports stars and actors. I remember reading Eric Cantona’s in its entirety in one sitting on Christmas day. Then one day my friend Matthew handed me a book and told me: “You need to read this, it’s phenomenal.” The book in question was “The carpet people” by Terry Pratchett and it was, indeed, phenomenal. This was the first of two books Matthew did this with. This one was when we were in Y7. The next would be two years later. After reading the carpet people I was hooked on the writing of Terry Pratchett, and I spent the next couple of years reading his back catalogue and nothing else. The only none Pratchett book I remember reading during this period was “The Cuckoo Sister”, which we studied at school. I quite enjoyed it, but it didn’t leave a lasting impression. I assume we read other stuff during this time, but I don’t remember it! Then Matthew handed me another book, “Of Mice and Men”, with a similar line. He gave me it on the bus home, I missed my stop because I had become engrossed in it. I thought it was brilliant, and have read it many times since. This sparked an interest in other books. My mum has a collection of classics which included “Grapes of wrath”, another fine book. I read “Tom Sawyer” (a great book) and “Huckleberry Finn” (a truly amazing book). My reading had widened but I was still reading Pratchett, Gaiman and the such and was enjoying the contrast. There were also many texts to study at school, some I’ve forgotten entirely, but some stuck with me as I thought they were brilliant. I loved MacBeth, The importance of being Earnest, The Speckled Band, Examination Day and Lamb to the Slaughter. I loved the poetry of Healey, Armitage, Owen, Byron and Hughes. About this time a modern day retelling if Great Expectations, starring Ethan Hawke, was released. I loved this film and so read the book and was totally blown away (not quite as blown away as my English teacher, Mr Gibbons, was when I appeared at his room to tell him I’d read it, loved it, wanted to discuss it and wanted his advice on which of Dickens work to read next!). I read A Christmas Carol, Bleak House and The Pickwick Papers and loved them all. I then read a tale of two cities, and was disappointed. I had heard it was his finest work, but I didn’t think it was a patch on the others I’d read. These books helped me understand the world, and the people in it. As I grew up I read many books and plays from many genres. I had a classics phase, where I read Metamorphises, Aeneid, Illiad and Odyssey, truly living them all, but preferring Homer to Virgil and Ovid. I had a real Gothic phase, reading Daphne du Maurier and Mary Shelley, I read a lot of Marx, Swift, Orwell, Huxley, Miller and Foot. I continued to read Sci Fi and fantasy, really enjoying Douglas Adams and Hg Wells. Its not only classics and Sci Fi though, I also love thrillers, particularly the work of Dan Brown, Lee Child and Stephen Coonts. I love to read science and maths books too. Simon Singh’s, Ian Steward’s, Stephen Hawking’s and Richard Dawkins’s especially. I thoroughly enjoy “The science of the discworld” series, where Pratchett weaves a novella around some real hard science from Ian Stewart and Jack Cohen, combining two of my favourite genres! These days I also read a lot about education, blogs, articles and books, all of which I find interesting, fascinating and enjoyable. At 5: The Carpet People, Terry Pratchett : A phenomenal and funny book that got me back into reading fiction and opened my eyes to a whole new world. At 4: Of Mice and Men, John Steinbeck: A phenomenal book that entertained and moved me. I have often said this is my favourite book, but in writing this post I have realised there are a few I prefer. Again, this book opened my eyes to q whole branch of fiction I was unaware of. At 3: The Adventures of Huckleberry Finn, Mark Twain: This book is amazing. It is a dark satire on all that Twain viewed to be wrong with the world. It is hilarious, thought-provoking and entertaining. When I finished reading it, I read it again, straight away. At 2: Great Expectations, Charles Dickens: this book is immense. It made me realise that even though the world has changed so much since then, the relationships and interactions still have relevance in our world. It made me thirst to know more about the time, and it made me seek out my English teacher to discuss it at a higher level. What more could you ask for in a book?! While writing this list I’ve changed my mind numerous times, on the order and what should be included. I’ve settled on these because I think they are brilliant, and some of them led me to whole new genres. Some of the ones that nearly made it: Death of a Salesman, Hitchhikers Guide, Odyssey, Demons and Angels, Wages of Sin, Good Omens, Rebecca, MacBeth, The Time Machine, Henry V and there are many, many more.